We have an inspection in our future new home this week. I have been a little excited and if you follow me on Pinterest you know I have been pinning home decor ideas like crazy! The new home has an actual laundry room, my first that isn't a closet or outside, and I am excited about all of the fun ideas. 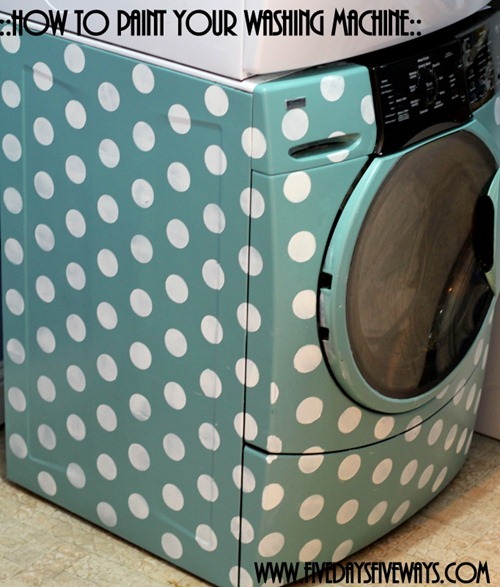 Ideas like this DIY polka dot washing machine. Five Days 5 Ways has a tutorial for painting a washing machine. This is a fun fix if you happen to have a mismatched washer dryer set or if you are really in love with polkadots. How cute!! The polka dots made me smile!